A comprehensive approach to self-realization, psychosynthesis was developed between 1910 and the 1950s by the Italian psychiatrist Roberto Assagioli. Assagioli like Jung, diverged from Freud in order to develop an understanding of human nature that took account of spiritual dimensions. This book, originally published in 1987, is an exploration of psychosynthesis and the depth of mystical and scientific ideas behind it. It will be of great value to all those interested in personal integration and spiritual growth in general, and psychosynthesis in particular. 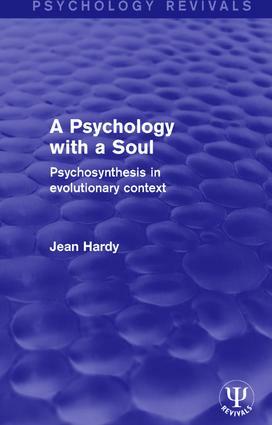 Focusing on psychosynthesis as transpersonal psychology, Jean Hardy describes how the ideas behind psychosynthesis spring both from scientific study of the unconscious and from the long mystical tradition of both the Easter and Western world. She shows how the roots of a modern spiritual, or transpersonal, psychology lie in a split tradition within the Western world – while psychology aspires to be scientific, religion or mystical knowledge is currently studied within the discipline of theology. The two have up till now been very little related, and the special achievement of psychosynthesis as a therapy is that it relates the soul and theology to the personality and psychology, and perceives personal and developmental patterns as a microcosm of larger social and historical patterns. General Introduction. Part 1: Psychosynthesis: History and Concepts Introduction 1. The History and Development of Psychosynthesis 2. The Nature of the Person 3. Subpersonalities and the Possibility of Synthesis 4. The Search for Meaning: The Self, the Superconscious and the Collective Unconscious 5. Psychosynthesis, Therapeutic Work with the Unconscious: Dreams, Symbols, Myths and Fairy-Tales 6. Techniques in Psychosynthesis Work with the Unconscious 7. The Possibility of Synthesis Part 2: The Split Between Scientific and Religious Knowledge Introduction 8. The Split Development of Scientific and Mystical Thinking over the Last Four Hundred Years 9. The Nature of Mysticism, Particularly as Applied to Psychosynthesis 10. The Influence of Plato 11. The Gnostic and the Neoplatonic Traditions 12. The Kabbalah and the Jewish Tradition 13. The Influence of Dante 14. The Alternative Mystical Tradition traced through the Renaissance and into the Modern Period 15. Religion and Mysticism at the Turn of the Nineteenth/Twentieth Century 16. The Nature of Science in Psychology and Psychotherapy 17. The Development of Psychotherapy and Dynamic Psychiatry: The Scientific Study of the Unconscious Part 3: Developments in the Twentieth Century Introduction 18. Psychosynthesis in the Context of Twentieth Century Developments in Psychotherapy 19. Psychosynthesis in Relation to Twentieth Century Mysticism 20. Summary and Conclusion: A Deeper Synthesis. Epilogue. Bibliography. Index.